If anyone asks me, which would you call as an authentic South Indian sweet, I would probably think and tell more than one. Yes! Indians especially the South Indians, love sweets. One such rich sweet is 'Sweet Pongal' also called Chakara Pongal. It is made with Rice and Moong Dal. You can also call it Pudding? I guess so.Not sure though. Anyways, Ven Pongal and Chakara (Sweet) Pongal are made specifically on one of the South Indian Festival called 'Pongal'. Pongal is considered to be the harvest festival and is celebrated in India as one of the auspicious day. It is similar to the Thanksgiving. Generally this festival is for 4 days and you can know more about the Pongal festival following the link. Even now, in Temples we get this Pongal as 'prasad'. They give only little but it will taste like 'Amridham'. I love this recipe. This is one of the easiest and richest sweets I know. In a Rice cooker or an ordinary cooker, cook the raw rice and moong dal together with water. For both Ven Pongal and sweet pongal, you must cook with excess water. When this is cooked in a pan, melt the jaggery and filter it if it contains any dust particles. Add this jaggery water to this cooked mixture and mix well. In a pan, add ghee/butter and saute cashews and raisins. Add this along with the ghee to the cooked mixture and mix well. Note: Before serving, if you add little more melted butter/ghee, the taste will be awesome. My Dear Uma and Srilekha, gave me the following awards. Thanks you so much. It means a lot to me. Getting recognized, is a very proud feeling. They all deserve it. Enjoy buddies! Congratulations on your awards! And you're passing them to me??? Wow! Thank you, thank you very much! I am truly honored! Pongal is such a comfort food Sangeeth! Your pongal looks so delicious and tempting. Congrats on the well deserved awards. i love pongal. havent tried the sweet version. this looks yummy. congrats on ure awards. and thank u soooo much for passing them on to me. it means a lot. Congrats on your award and I love pongal.Nice pic. i love chakra pongal too..congrats on your awards.. Thanks a lot Sangeeth! I appreciate your kindness and every comment you leave in my blog. Congrats on the awards. 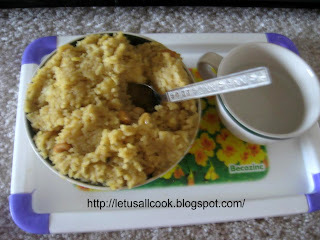 Hey i also blogged pongal recently.. urs looks delicious. Thank you for passing it to me..
Wow recipe looks very easy to cook and healthy to eat. Congratulations on winning those awards.